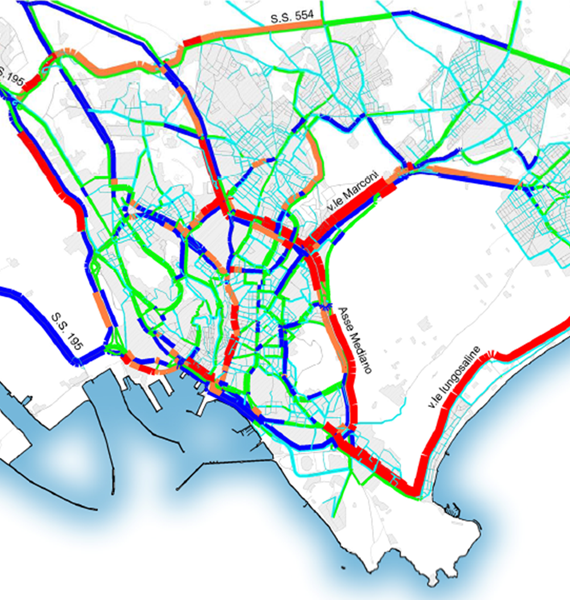 The study involves the existing SS554 Cagliaritana, bypass road of Sardinia’s largest city: Cagliari. The overall objective of the study is the redefinition of SS554 road, through the removal of at-level junctions located along 10km of the entire road’s blueprint. The envisaged redefinition requires a transportation analysis aimed at verifying the effectiveness of the proposed design solutions and mitigation measures. Systematica supports the designers in drafting the bidding project by providing the following consultancy services: overall verification of the proposed interventions’ effectiveness, through the implementation and calibration of a wide-area macro-simulation transport model, involving both Cagliari and its surrounding areas, and; detailed assessment of most significant junctions’ performance, through the implementation of a dynamic micro-simulation traffic model. The macro-simulation model is implemented with CUBE (Citilabs), while the micro-simulation model is built with S-Paramics (Sias). The results of the simulations elaborated by Systematica are used to understand the impact of the construction phase on the overall circulation conditions. Multi-scaled simulation models (macro and micro) are developed to verify the project’s effectiveness and to assess the impact of the construction phase on the existing circulation.